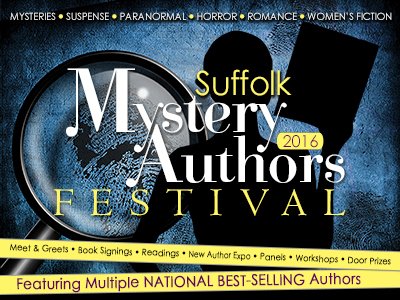 A busy week ahead, including a mystery writers panel at library Thursday evening in Alexandria, VA, and a full day of activities Saturday at the Suffolk Mystery Authors Festival, which features some terrific authors! Below are details on each—and a quick bit of additional info: I’ll be sharing table space with my good friend B.K. Stevens all afternoon Saturday for meet and greet and book signings. We’ll have some giveaways at our table too, so everyone attending should stop by! Reading from On the Road with Del & Louise • 2:45 p.m.
Panel: “It’s A Marathon, Not A Sprint: Pacing Mystery & Suspense,” with Frankie Y. Bailey, Mary Lawrence, Judith Lucci, T.J. O’Connor, Amy M. Reade, and LynDee Walker, Birdsong Theater • 3 p.m.